The global economy has created opportunities for businesses of all sizes. Tapping a worldwide market can help your business acquire new customers or locate new suppliers. To take advantage of these global opportunities, you need a reliable international payment solution from a provider with the expertise to help you navigate what can be a complicated process. That way you can focus on managing your business. 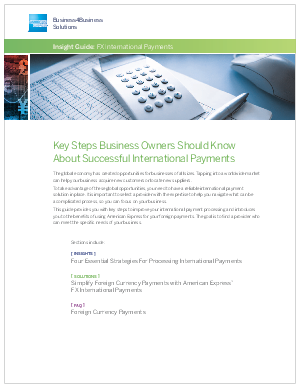 This guide from American Express® provides you with key insights to help improve your international payment processing and introduces you to the benefits of using American Express for your foreign payments. American Express® FX International Payments provides your business with competitive rates, no setup or maintenance fees, outstanding customer service, real-time exchange rates, online data management system, and, of course, security and reliability.